(Bloomberg) -- Friday’s surge in Chinese stocks rounds up a winning quarter for the country’s investors. China’s equities have outrun every other national market in the world in the three-month period. The CSI 300 Index’s 29 percent rally is its best since the end of 2014, when the nation’s equity bubble was forming. Apart from a Taiwanese chipmaker, a Brazilian steel producer and Latin America’s largest utility, all the top 30 performers on MSCI Inc.’s emerging-market benchmark are Chinese companies. The bond market had a good three months too, with the yield on 10-year government debt falling for a second quarter toward 3 percent. Further inflows are expected in China’s $13 trillion onshore debt market, about twice the size of the nation’s equity market, as the bonds get added in a key global index from April 1. Global jitters -- triggered by last week’s yield curve inversion in the U.S. -- fueled demand for the asset. That’s after China’s monetary easing boosted bond buying earlier this quarter. The yuan also strengthened, set for its first quarterly gain in a year. For all the newsflow around trade negotiations, China’s economic data-dump and the government’s more detailed plans to boost growth, it’s been a relatively dull month for currency traders. Historical 30-day volatility this week reached the lowest since January 2018. 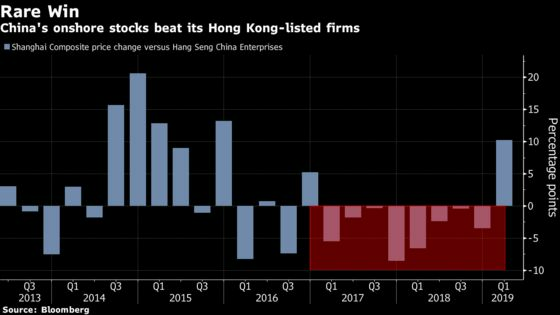 The rally onshore has left Hong Kong in the dust: the Shanghai Composite Index beat the Hang Seng China Enterprises Index this quarter for the first time in two years. China’s government-backed firms are being stingy. That mainland-Hong Kong Chinese stock premium is huge. Local government debt - the bomb that doesn’t explode. Default-free bonds remain everyone’s favorites. Cannabis craze comes to China’s stocks and regulators aren’t happy. Watch out for the canola-oil spat. $75 million bespoke homes for Hong Kong’s super rich. Shares of Hong Kong developers are at record highs. The last time Goldman loved Moutai this much, it ended badly.